Unfortunately one of the side effects of age (for most of us) is wrinkles. Even worse if you take someone like me who has never really had the best skincare routine your skin can look pretty rough. Thankfully despite my lack of a good routine my skin is not in terrible shape. I’m even more thankfully that I will be learning a great deal of information about beauty and skincare using the RoC Academy, an exclusive online resource that provides a behind-the-scenes look into skincare, and I’ll be sharing some of that information in a follow-up post later this month, so don’t miss it. I will admit I am definitely in need of some de-wrinkle help, and not the kind that you through in the dryer for a quick spin and wrinkles are removed! I am rarely this transparent because yes I hate my wrinkles. This is one area where many women get wrinkles as they age and this mama is no exceptions. Nearly 40, and when I say nearing I mean in 4 days YIKES, I have noticed that I’ve started to take notice of my skin, my health, and things that I may have otherwise taken for granted. 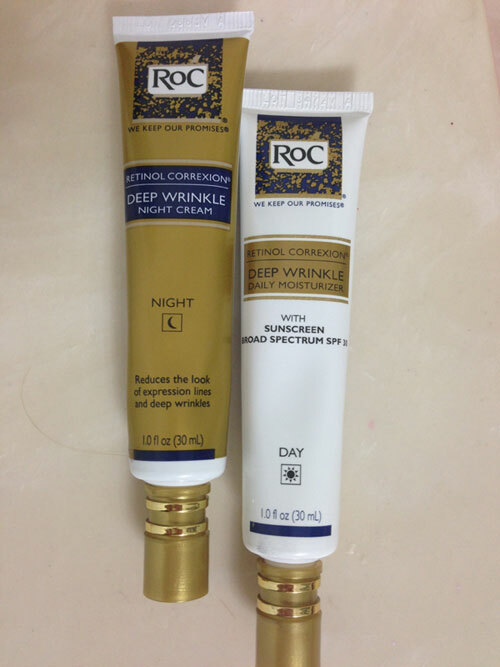 I received some RoC Skincare products that are suppose to help me with my wrinkle of a problem. Fades the look of wrinkles around the eyes, forehead, and cheek while also improving the overall signs of damaged associated with sun exposure. Sounds exactly what I need, as a future sun worshiper, and I didn’t mention above I also have some pretty big laugh lines. When I’m smiling I love them. When I’m not smiling, not so much. When I’m a little thinner they are very noticeable. So this was the first thing I decided to try. There is a warning that you may experience a little tingle or tightening with the product but I did not feel this effect at all. The anit-wrinkle treatment went on very smooth. The resurfacing serum seemed oily to me at first but it blended right in and my skin actually began to feel smooth and clean. My daughter made a comment that she loved the smell of the product. This product is made to be worn at night before you go to bed. I’m not really sure that I need anything additional at night since I’m using the resurfacing system so I will be saving the night cream pictured above for when I’m finished with the system. The day cream however I will be using during the day to help reduce those nasty wrinkles. Contains an exclusive combination of pure retinol and the latest sunscreen technology that is specifically engeineered to deliver very broad and photostable UVA and UVB protection with an SPF 30. I’ve also decided that along with the resurfacing system and daily moisturizer I’m going to give my eyes a little added help with the eye cream. When you apply the cream, the formula starts to work immediately to smooth skin’s surface. With continued use, you will notice a visible reduction in wrinkles around the eye, crow’s feet, dark circles, and puffiness. Before receiving this products my routine was nothing more than wash and go. Once in a while when my skin feels dry I add some moisturizer, as I mentioned my routine has never been all that great. Since these are such big issues for me I’m really hoping to see an improvement with these new products. According to the labeling on most of the products you will start to see results in 4 weeks, more in 8 weeks, and even more in 12 weeks. I can’t wait to see how well it works. You can pick up all of the products listed above at your local Walgreens. Prizes! 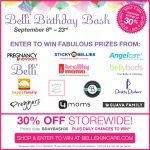 We will randomly award five prizes throughout the party, from all eligible correct responses to trivia questions. 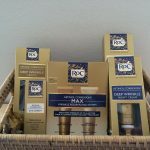 Each prize includes an assortment of RoC® Skincare products with an estimated retail value of $100. 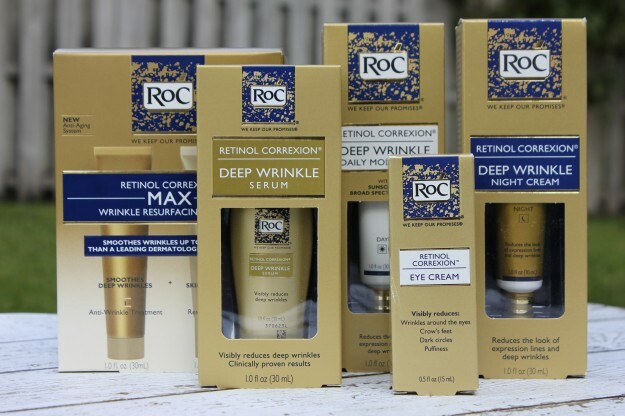 Enter to win a gift basket of RoC Skincare products. 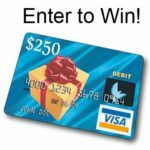 Think skincare and enter below! This post is brought to you by The Motherhood, who sent me a box of products and compensated me for my time. Opinions, experiences and photos shared here are all my own, and I hope you enjoy them. I would love to know if they are good for dry/sensitive skin as well! What else can I do beside using sunscreen to help prevent age spots? 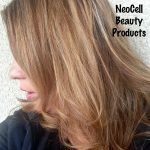 I am noticing smile lines, crows feet, and some discoloration of my skin as I age…Are these all things that this system can help? It’s so hard because I have combination skin..dry but oily, so I would love to find something that will help! i have super dry flaky skin special on my forhead,what else i could use beside my sinscreen i use? I know this sounds stupid, but I have been reading about retinol and still don’t understand exactly how it works…..maybe you can explain it, in non-scientific terms? Thanks! What’s the best product for acne prone skin that is beginning to show some small wrinkles around the eyes? We live in such a dry area. It seems like my skin gets really dry at times no matter what I use. Any suggestions? My skin is very delicate and I’m exposed to the sun when I start to go dark spots besides the sunscreen creams can I use that will not harm my sensitive skin? Maybe if there planning a BB Crème. What’s the best product for oily and acne prone skin? What’s the best product for dark spot fading? Also, is there any way to tell the amount of active ingredienets in different products? My skin tone on my face is so uneven; is there any products to correct this? Is exfoliation using a facial brush beneficial? 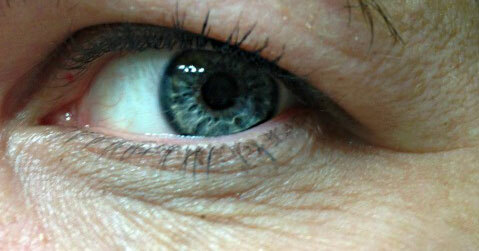 Crows feet are so close to our eyes, how safe is it to put this on our eyes? Is coconut oil a safe solution for dry skin? Sensitive skin is my issue. Crows feet are starting to show. I like to spend a lot of time outdoors and tend to squint. What is the best way to deal with these issues? I would love to see if there is an answer for cobo skin that is dry and normal. I have dry patches as my main problem. I would like to know how to make my skin tone look less even, the cold weather has really played havoc with my skin. Have you ever tried the skin rollers that supposedly prompt collagen production? Is this just another gimmick? I’d like to know the best ways to correct and prevent age spots. I would love to know the best way to correct sun spots. As I’ve aged (in my early 40s now), the texture of my skin has changed. How do I get the softness and suppleness back? What would be the most easiest way to pamper my skin at night when I just can’t wait to go to sleep from a long day? I’m a lazy person sometimes and I really want to know what would be the baseline for my skin to still feel remotely alive the next day. Is there a facial cleaner that works best with these products? What would be a great night cream to use for sensitive skin? I have rosacea and my skin tone is uneven. What can I use that is gentle, but will work? I would love to know if there is some way to visibly improve your skin texture.The older I get the drier and less supple my skin is..all over.I hate it and it makes me very self conscious. I have extremely dry skin and being pregnant bad acne. What would work best for this type of combination, or what other products can I use for this. What products would be best to use for someone beginning to show signs of aging (fine lines&dryness)? I have just recently turned 60 and would like to know besides using great products to clean and moisturize your face, what other things help your skin not to age. I know a lot of fluids/water is recommended but what else would you recommend. How can I make my dull complexion vibrant? Also, are there exercises that we can do to help from our face not aging ? What is something we should be getting into the habit of doing that most women aren’t aware they should be doing to help our face look more youthful. I’d like to know how to get rid of the redness in my skin – my cheeks. It’s terrible. I have dark circles under my eyes is there something besides make up I can do, some kind of cream I should use? Will these products take away discolorations on the skin? How much spf should be in the products I use on my face? I see some with 15spf up to 30spf. Do these products actually reduce wrinkles or just the appearance of them? I could use this, I really need to take better care of my skin! 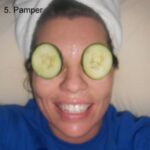 Will these products help reduce the fine lines around my eyes? Do these products have a scent to them? or are they unscented? What’s the best regimen for targeting breakouts, oily skin & enlarged pores while still working to reduce the appearance of fine lines and wrinkles? I would like to know if RoC makes a sunscreen that is mineral based since I’m allergic to most other standard sunscreens. I get black bags under my eyes what should i do? Help for age spots brown spots on face. Products for women over 60. What is a good solution for sensitive skin that breaks out (even at 35!). Solution to combination skin with slight psorasis. I would love to know how to treat/reverse the “worry” lines above/between my eyebrows. What is the best eye cream with an SPF to help with crows feet? What natural remedies would you recommend to control oily skin? 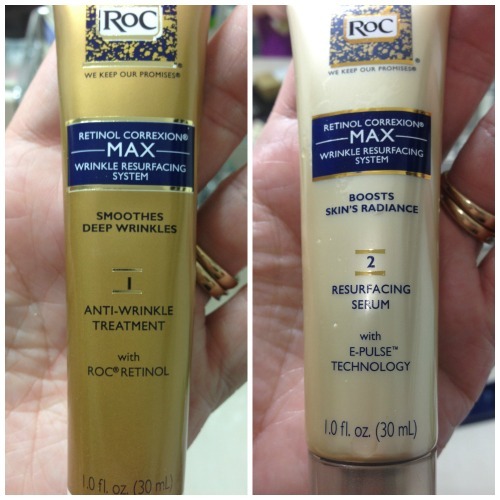 What can Roc do for diabetic skin?